Below is my “Big Day Out” column from the Saturday, June 2, 2012, Swansea edition of the South Wales Evening Post. RICHARD THOMAS heads to Tomos Watkin Brewery in Swansea. WHY? At Tomos Watkin’s brewery in Llansamlet, Swansea Enterprise Park, groups can take a tour of the famous Welsh brewery and sample their award wining beers and ciders for free after paying for the tour. WHAT'S THE BUZZ? The tour consists of a three hour visit and starts with drinks and a warm welcome on arrival from one of the brewers who will give you a 20 minuet talk about the history of the Hurns Brewing Company and Tomos Watkin. This is followed by a tour around the brewery which lasts around half an hour where visitors are shown the full brewing process from raw material to packaging the product. After the tour visitors relocate back to the brewery tap for more sampling of the finished products and there is also a cold buffet including sausage roles, crisps, chicken legs, cocktail sausages and other snacks available. ANY HISTORY? The present incarnation of Tomos Watkin was started in 1995 by Simon Buckley and first operated from a small brewery in Llandeilo, Carmarthenshire before moving to their current premises in Swansea Enterprise Park in 1999. The Hurns Brewing Company acquired the Swansea brewer in 2002 and today Tomas Watkin exports their beers and other beverages to countries around the world, including the United Arab Emirates, China, Singapore, France, and the United States. LOOK OUT FOR? At the start of the tour chief brewer and tour guide Alex Cunningham hands out samples of the different varieties of malt the brewery uses to make their world famous beer. There's even a chocolate flavour to try. Later visitors get a chance to look into the vats where 16,000 pints worth of beer ferments every day for export across Wales and around the world. WHAT TO TAKE? There is a minimum of 12 people and a maximum of 25 people per tour. Cameras are allowed on the tour and visitors are encouraged to take as many photos as they want of the brewery, or even make a video of their tour. Go to http://youtu.be/G2TQ7w_DESE to see a You Tube video of my visit to Tomos Watkin. WHEN TO GO? The tours cost £22.50 per person Monday to Thursday from 6pm to 9pm, there are also Friday tours available at £25 per person from 6pm to 9pm. For the same price as Friday tours, visitors can book a tour anytime between 12pm and 8pm on Saturdays. You must be over 18 to visit the brewery at these times, but there are school tours available at other times. To book a tour or find out more, send an email to shop@tomoswatkin.com. TELL ME MORE: For sat-nav users the address and postcode is: Unit 3, Century Park, Swansea Enterprise Park, Swansea, SA6 8RP. More information is available on the website at www.tomoswatkin.com, or, you can phone 01792 797280. Below is my “Big Day Out” column from the Saturday, May 19, 2012, Swansea edition of the South Wales Evening Post. RICHARD THOMAS heads to Laserzone in Swansea. WHY? Fans of Arnold Schwarzenegger's favourite alter ego the T101 will recall the high-tech laser battle fought between humans and machines at the beginning of Terminator 2: Judgment Day. At Laserzone in Swansea you can get a taste of what it would have been like to be on the the set of James Cameron’s classic film, while you and your team take part in your own futuristic warfare. WHAT’S THE BUZZ? Located opposite Castle Square next to Swansea Castle, Laserzone is a high-tech, live action laser game played in a multi-level themed arena with special effects, fog, laser beams, pulse pumping music and other players/targets combining to create the ultimate laser adventure! ANY HISTORY? Lazerzone is located inside the former Castle Cinema which first opened in 1913. The former cinema building located adjacent to the grounds of Swansea Castle was the only building left still standing in vicinity of Swansea's Castle Street after the end of the Second World War. LOOK OUT FOR? There are some arcade games to keep you occupied while you wait for your turn to play, but the highlight is definitely the Laserzone game itself. Each player is given a laser pack consisting of a laser weapon and body armour. The gun and body armour both have hit sensors built into them, all of which have different score ratings. Your end score depends on your hit to shots fired ratio and how many times you’ve been hit by other players. Up to 30 players can play at once and you can choose to either play as part of a team or go it alone as an individual. WHAT TO TAKE? Wear casual clothes, dark colours would be best. Anyone aged eight years old and over can play at Laserzone. Prices are just £4 each for one game or during off peak times £6.50 each for two games. During peak times (weekends and school holidays) it costs £7.50 for two games. Becoming a member is a good way to save more money and only costs £10 for one year, after you become a member you get money off each time you return to play. Also, every Wednesday between 2pm and 4pm and again between 8pm and 10pm students with a valid NUS card get to play for £5. And on Sundays between 10.30am and 12pm under 16’s get to play a minimum of 3 games with a free squash drink for just £7.50. If you feel hungry after playing there are some snack machines to use and a pizza restaurant, Pizza Express, is just next door as well as other restaurants. WHEN TO GO? Laserzone is open seven days a week. Monday to Friday groups can play from 12pm to 10pm, and on weekends games are played between 10am and 9pm. During school holidays games start at 11am and finish at 10pm. TELL ME MORE: For sat-nav users the address and postcode is: Laserzone, Castle Buildings, Worcester Place, Swansea, SA1 1JQ. 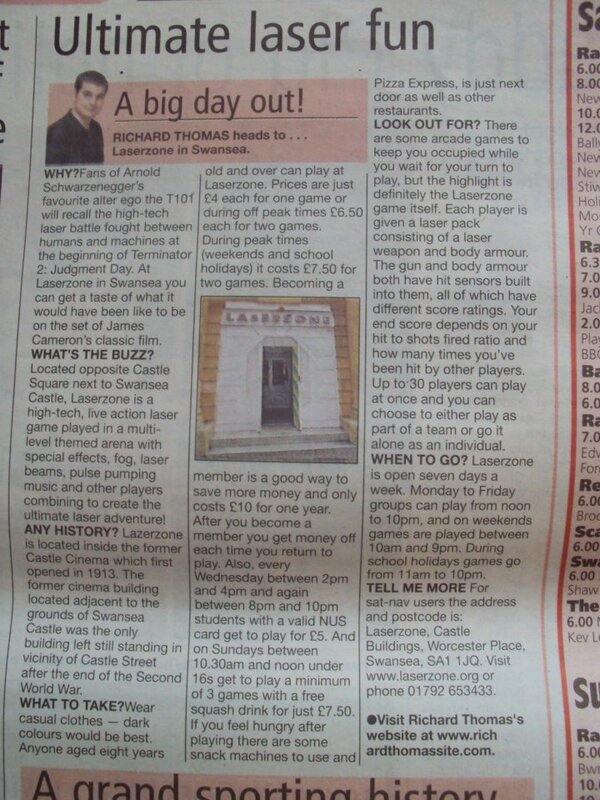 More information about game prices and opening times can be found on the Laserzone website at http://www.laserzone.org/ or by phoning 01792 653433. Visit Richard Thomas's website at http://www.richardthomassite.com/. 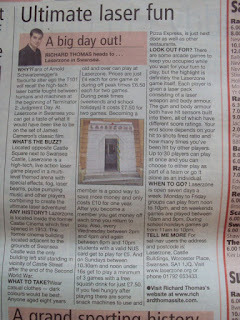 Below is my “Big Day Out” column from the Saturday, May 12, 2012, Swansea edition of the South Wales Evening Post. WHAT TO TAKE? There is a fee of £5.95 for adults and £4.95 for children. Seniors and disabled visitors only pay £4.50 and you can opt to buy a supersaver family ticket which covers two adults and up to four children for £25. Meals are available in the centre’s fabulous Tea Rooms. Also, don’t forget to bring a camera with you. WHEN TO GO? The centre is open from 10am to 5pm all week. Today and tomorrow the centre is holding its annual Cheeses and Cider Weekend, where visitors can come and try a wide variety of Welsh ciders and cheeses. There will also be live music, plus a bar, BBQ, cider press demos and lots more to check out. TELL ME MORE: For sat-nav users the full address and postcode is: Gower Heritage Centre, Parkmill, Gower, Swansea, SA3 2EH. More information about entry prices can be found on the Gower Heritage Centre website at www.gowerheritagecentre.co.uk or you can phone 01792 371206. Below is my “Big Day Out” column from the Saturday, May 5, 2012, Swansea edition of the South Wales Evening Post. This week RICHARD THOMAS heads to Pembrey Country Park in Llanelli. WHY? Set against the spectacular backdrop of the Gower Peninsula and overlooking the coastal scenery of Carmarthen Bay, Pembrey Country Park is one of Wales’ top visitor attractions providing a unique blend of coast and countryside. Consisting of some 500 acres of parkland, you can enjoy a picnic then check out the ski slope, Cobra toboggan ride, steam railway and many other facilities inside the park. WHAT’S THE BUZZ? There is something for everyone inside the park. Walkers will enjoy the eight miles of golden sands at Cefn Sidan beach, while cyclists will prefer to explore Pembrey using the two-mile off road cycle track, ideal for beginners and families. More experienced cyclist can also access the adjacent Celtic Trail and cycle for miles. Cyclists can either bring their own bike or hire one at Ski Pembrey, one of the most up-to-date winter sports facilities in Wales with separate ski and snowboard areas as well as a toboggan ride. Trekking through the forest on horseback is an experience not to be missed either. Horse riders can pick from 25 lovely ponies and horses available for hire. Dogs are also welcome at Pembrey as long as their owners are able to keep them under control. LOOK OUT FOR? Open all year round, Ski Pembrey has an Alpine Ski Lodge and Café, as well as a floodlit 130 meter main slope. It is the Cobra, Wales’ longest toboggan ride that the kids will want to go on other and other again, though. ANY HISTORY? The land which the park is now located was once the site of the Royal Ordnance Factory. The area became an industrial estate after WW2 but was largely derelict by the early 1970s when it was acquired by the local authority, who developed it as a Country Park. Many features relating to the 20th century military and industrial use of the area survive inside the park, including railway lines and WW2 bunkers. In 2010 Pembrey became home to the Beach Break Live music festival. WHAT TO TAKE? Between April and October all vehicles are charged £5 to enter the park except on days when the barrier is unmanned, when the price is just £2. There are also seperate charges to use the different facilities inside the park. To use the ski slope costs £8 for adults and £5 for juniors. The Cubbra toboggan ride costs £2 per ride or £4 for three rides. WHEN TO GO? The Park is open daily from 8am to 10pm, but the different facilities inside the park have their own opening hours. TELL ME MORE: Pembrey Country Park can be found just off the A484 Llanelli to Carmarthen coast road just outside Burry Port. The Park is approximately a half hour drive from Carmarthen and a similar distance from Junction 48 M4. For sat-nav users the postcode is SA16 0EJ. More information can be found at www.carmarthenshire.gov.uk. You can also send an email to leisure@carmarthenshire.gov.uk or phone 01554 742424. Below is my “Big Day Out” column from the Saturday, April 28, 2012, Swansea edition of the South Wales Evening Post. RICHARD THOMAS heads to Skidz Karting in Swansea. WHY? Skidz Karting is Swansea’s only indoor go karting track. With karts and tracks suitable for all ages and abilities, drivers young and old will have a great time trying to beat each others best lap time on the tracks. WHAT’S THE BUZZ? Measuring 330 meters in length and consisting of an exciting mix of tight bends, sweeping curves and great long straights, the 6 meter wide main track allows for plenty of overtaking opportunities and provides plenty of challenges for even the most experienced go karter. There’s also a great track for younger drivers, providing plenty of fun but still nice and safe with a secure pit lane area for safe pit stops. Children as young as three can take part. There are three types of kart available: electric KIDZ KARTZ that travel up to 6 miles per hour for three to eight year olds, SODI FUN KID petrol karts for eight to twelve year olds, and the worlds most popular kart the SODI GT4 for adults. LOOK OUT FOR? Along with two great tracks there is also a games room with driving simulators where you can get some practice before you go on the track, a pool table, air hockey table, and a cafe serving light refreshments to check out. ANY HISTORY? Skidz Karting opened last year. Although a popular sport in Europe today, go karting first began on the other side of the Atlantic. Art Ingels is thought to have built the world's first go kart in 1956 in California. Go karting quickly caught on with tracks built in many towns and cities across the United States. WHAT TO TAKE? Drivers will have to make a one time purchase of a balaclava for hygiene reasons, but these only cost £1.50 each and are yours to keep and bring back next time. All the other kit, including a helmet, overalls, gloves and a detailed safety briefing are provided for. Prices are £20 for 25 minuets during off peak times and £25 for the same during peak times, Monday to Friday after 4pm, Saturday, Sunday and Bank Holidays. WHEN TO GO? During the school term the go karting tracks are open daily between 12pm and 8pm, except Mondays when the tracks are closed. During school holidays Skids Karting is open seven days a week from10am to 12pm. TELL ME MORE: For sat-nav users the full address and postcode is: Unit 1, Rear of Queensway, Swansea West Business Park, Fforest-Fach, Swansea, SA5 4DJ. To book a place call 01792 580927. More information about opening times, prices and the go karting tracks can be found on the Skidz Karting website at www.skidzkarting.co.uk.